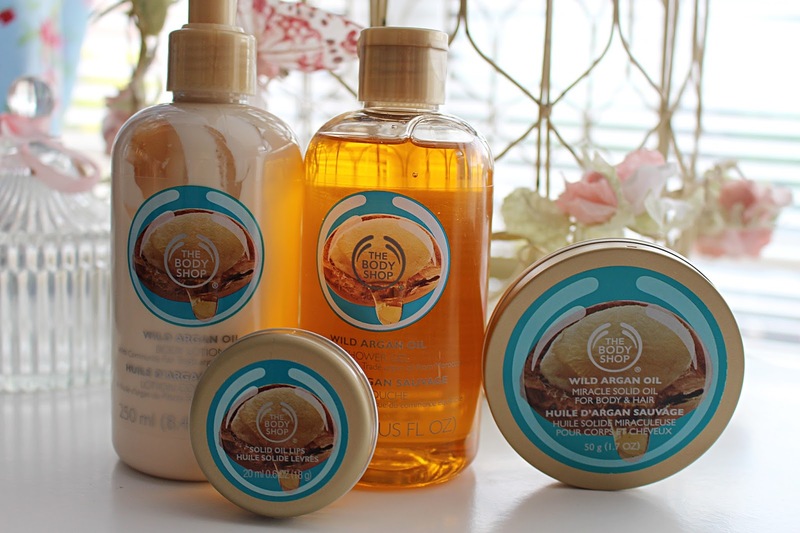 I'm a big fan of The Body Shop, so when a brand-spanking new range wings its way onto the shelves of the heavenly-scented store, I can't help but get a little excited. The range in question is the new Wild Argan Oil range, which contains a plethora of new products, a few of which I was lucky enough to be sent. The range actually contains eight new products, all of which are infused with radiant Community Trade Fair argan oil. There is a shower gel, body butter, a miracle solid oil, a solid oil lip balm, body lotion, radiant oil, body scrub and bubble bath. Definitely something for everyone looking to try the new range. I was sent a little selection from the collection and have been trialling them ever since. A few weeks after trying them, I think it's about time I fill you in on my thoughts on this exciting new range. Firstly - this range smells incredible. Whilst in the past I've found some argan oils to smell less than desirable, this selection smells completely delicious. The range smells super sweet, almost marzipan-esque, and I could literally smell it all day long. Probably not one for those of you who aren't keen on super sweet scents, but it's definitely a must-have for me. Onto the products themselves. The shower gel* has been a firm favourite of mine, so much so that I'm already nearing the dregs of it (does anyone else tend to go a tad OTT with products when they're a fan of the smell?!). It leaves my skin feeling soft and smelling delicious - everything you want in a shower gel, right? The body lotion* also smells divine and is a really luxurious and hydrating product that leaves my skin feeling really soft and smooth. One of the products that I've really enjoyed using has been the miracle solid oil* for body and hair - this unique multi-use product is perfect for taking away on holiday (no liquid = perfect hand luggage item!) and leaves both my skin and hair feeling nourished. Finally, another product I've been loving is the solid oil lip balm*, which is incredibly hydrating on my lips, and has become my go-to lip-moisturising product. Overall I am head over heels for this new range from The Body Shop and completely recommend it. I think all the products smell incredible and moisturise and hydrate amazingly well. Perfect if you suffer with dry skin/hair/lips! Have you tried anything from the new Body Shop range yet? Let me know what you think!